Memorial Day celebrations, kids out of school and summer is officially upon us. But that doesn’t mean that things are slowing down for the Ports-to-Plains Alliance. We are hard at work preparing for our annual conference that is scheduled for September 13 – 15 in San Angelo, Texas. Matthew Rooney, director of the George W. Bush Institute’s Economic Growth Initiative will be one of our featured keynote speakers. 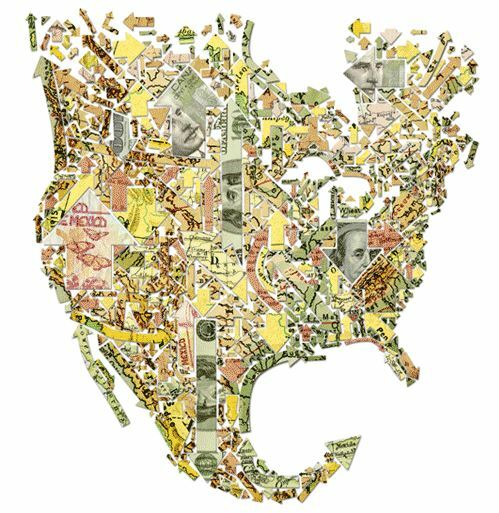 In this newsletter we link to an op-ed piece he wrote about the continued importance of North America. At a time when trade and our North American partners seem to be drawing increasing criticism, this piece is still timely and relevant. Having driven a great deal of the southern segment of the corridor from Eagle Pass, Texas to Raton, New Mexico this month, I can verify first hand that the Texas and New Mexico Departments of Transportation are hard at work making improvements on the corridor. Summer is a busy construction time, especially for our northern partners. When you drive through a construction zone please slow down and be mindful of the construction crews who are performing dangerous tasks to bring us safer and improved roadways. Americans can agree that the United States is geographically located on the continent of North America, and that Canada is to our north and Mexico to our south. Beyond that, agreement seems to be breaking down among many about the value of North America. Some even seem to think it would be a good idea to wall ourselves off from our North American neighbors, and that doing so would make us more prosperous and secure. But this kind of thinking ignores the numerous benefits to the United States of our geographical location. In fact, most of what we think we know about Canada and Mexico and our relationships with them is wrong. Even further, any move to build higher barriers to the movement of trade, investment, ideas and — yes — people in North America would make Americans less prosperous and less secure. The key to the prosperity and security of the American people lies in a closer North American economic relationship — in embracing the de facto North American community that has long existed and shaping it to ensure that it continues to enhance our security and prosperity. Matthew Rooney, a former senior official of the U.S. Department of State under presidents of both parties, is director of the George W. Bush Institute’s economic growth initiative. Mexico is the most important country in the world for Americans. No other people have as much positive impact on the daily lives of Americans across the board, from demography and society, to trade and national security. Unfortunately, there are those who would use Mexico and Mexicans as a political piñata. They are trying to drive a wedge between us no matter what the cost to North American prosperity and security. The world is full of people who would do us harm. Attacking Mexicans is like picking a fight with your best friend in a schoolyard full of bullies. Mexico and the United States are deeply integrated, for the benefit of both countries. Approximately 35 million Mexicans and Mexican Americans live in the US (equivalent to the population of Canada) and between 1-3 million Americans are in Mexico at any given time. We have the most legally crossed border in the world along 2,000 miles and 50 ports of entry, where we do over $500 billion dollars worth of trade each year. These numbers in order of magnitude are higher than those of other important international relationships, like that of France and Germany. Mexicans in the US are not “illegal immigrants”. 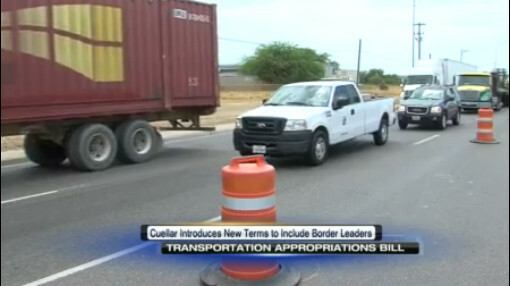 Congressman Henry Cuellar announced a change in the 2017 U.S. House Transportation Appropriations Bill. It would encourage local city and county representatives to be included in talks, when deciding how to use federal funds toward road projects. "If you notice behind me there when you come in the driveway there's a big hole there in the road then. That sort of shakes stuff up in the truck when you're running across them", said Thomas Grimes. A truck driver from Tennessee, who like millions of other drivers, wants safe, driveable roads. Grimes says that despite the abundance of trucks in the area - it's not always easy finding a place to park during the evening. "When I can't find nowhere to park I just have to go to a place that I can park and put on there and just get to a safe haven. Sometimes I have to park on the side of the road by the shipper in the road close to it", said Grimes. That could change if the house transportation appropriations bill goes through. Congressman Cuellar says the changes would make sure local leaders have a say when it comes to projects in their city. He explains why this was important for Laredo. As construction continues on Loop 335 south of Amarillo, there are some updates and safety reminders TxDOT wants area drivers to know. Just like any major construction project, the Loop could take many years to completely update to accommodate heavy traffic. But two projects currently under construction do have tentative completion dates. The bridge being rebuilt over BNSF railways between Georgia and Washington streets is expected to be complete next spring. And construction on the overpass between I-27 and Georgia Street is planned to finish by spring of 2018. Traffic patterns will continue to change for both these locations as they are upgraded. But the entire loop has a long way to go before all upgrades are complete. "It's gonna take a while," said Gus Khankarli, Director of Transportation, Planning and Development for the Amarillo branch of TxDOT. "Even in the metropolitan areas and other places of the state, I mean there are projects that they have been working on for many many years, so this is no different. So you upgrade based on funding availability and needs." There are several "needs" Khankarli has identified for Amarillo roads, including upgrading the I-40 and Loop 335 interchange at Lakeside Drive, and updating the Bell Street crossing over I-40. Plus, the I-40 bridges that go over Ross and Arthur streets are listed as some of the top most traveled structurally deficient bridges in the state. Lynn Helms never disappoints in his ability to connect the current state of the Bakken to an easy-to-understand analogy. At his always-highly-attended speech at the Williston Basin Petroleum Conference, he likened the current Bakken to that of a race. We are in lap 100 of a 500 mile race, he said, (if the race doesn’t add new technology, which would change everything). While the analogy seemed to resonate with attendees and make perfect sense—he compared a five speed shifter to oil prices noting that different oil prices push the Bakken’s activity levels to different speeds—it wasn’t the analogy that should have Bakken onlookers intrigued. It was the raw numbers he shared on future well count and planned activity. Could Midland have 3 interstates in the future? While the city of Midland and Permian Basin Metropolitan Organization get ready to meet today to see what’s possible for expansion in northeast Midland near State Highway 349, a reader recently inquired on Facebook about whether Interstate 27, which starts north of Amarillo and ends south of Lubbock, would ever extend southward to Midland. The Reporter-Telegram reached out to all-things-interstate-planning guru James Beauchamp, president of the Midland-Odessa Transportation Alliance last week for his thoughts. A lot has changed since that study, however. “If you look at those three routes since 1997, all of them except the route coming to the Midland-Odessa area have lost a significant amount of traffic,” Beauchamp said. Even though traffic on the Midland route has increased, Beauchamp said turning it into an interstate-grade highway might not be justifiable because traffic counts between Midland and Lubbock don’t support the need to upgrade, especially considering that each mile of interstate costs $10.5 million to construct. Opinion: Why can't Congress stop the EPA's assault on private property rights? Karl Marx wrote that, "The theory of the communists may be summed up in the single sentence: Abolition of private property. The Environmental Protection Agency's (EPA) "Waters of the United States" regulation may not be the abolishment of private property rights that Marx had in mind, but it's one heck of a start. Before chalking this off as an exaggeration, let's rehash the breadth of EPA's rule.